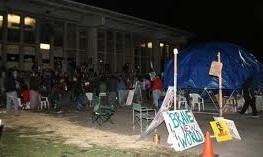 Occupy Santa Cruz has had in three days three major setbacks. Perhaps they were fruitless attempts to set back the movement. The last one in the series, that the police wish to pull off today Wednesday Dec. 7, is the eviction and dismantling of the tent city of Occupiers (and previously homeless folk) downtown at San Lorenzo Park by the river. [Update: the tent city was partly abandoned by dark Wednesday, and the police came in after 7 AM, arresting six people] The police and their backers might think they are on a roll. This Culture Change report shows this thinking would be flawed. Whether the movement is viable or not, or a threat to the dominant order and the 1% or not, the poor have to be somewhere. So it's heartless for a homeless encampment -- home -- to be razed. It's as if it were a center of violent crime preying upon the surrounding community. The police state and the 1% want people divided and to fear the poor, and to shy from community cohesion (unless it's only to affirm the elite's aims). Alliances can change shape day to day. One day the Occupiers seem to represent "only" perhaps 33% of the public. At other times, given the humanity on display in proud form, Occupy is actually a 100%-population movement in disguise. Within any given Occupy group, disagreements happen constantly. Despite strife (mostly from the police) and admitted uncertainties, the Occupy movement is the still best thing going in this country, and even perhaps globally. That's from what I can see, even though I have questioned the movement's grasp of sustainability. I've been monitoring Occupy and participating a bit in some locations, so that helps me to pass along some of the basis for the seemingly mysterious passion and success the movement has enjoyed. 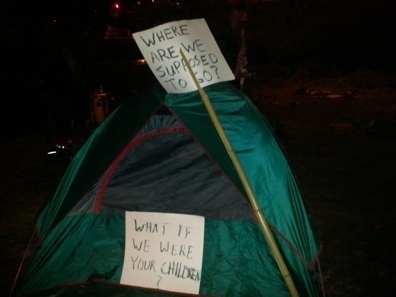 For some participants, Occupy means there's a place one can go when there's nothing else. Sometimes a person needs fellow citizens' help for a meal, discussion, and positive action. Prior to Occupy, for the very low income there was only a choice of submitting to a mostly inadequate institution or living on the streets -- unless one was clever enough to have a work-trade residence on a small organic farm, perhaps. As for the institution option, it can be a shelter or other charity, but institutions are non-participatory in internal and external politics, except for a few groups such as Food Not Bombs. (Tellingly, the latter is not an institution, but a decentralized mini-movement.) The other choice, the proverbial sleeping under a bridge, is all too common, whether one is dysfunctional due to mental illness or just plain desperate. After all, to go off freely to enjoy a state or national park on an "unemployed vacation" one almost always needs a car as well as fees for camping, money for food, etc. -- these are the lucky downtrodden, comparatively. So Occupy is proving to be the best alternative, in many locations, to the brutal cash economy that has left so many casualties out in the cold. The Great Recession also freed some for a hipster's vacation -- a middle-aged activist I knew from Oregon has joined the Santa Cruz tent city and participated in the General Assemblies on the court house steps, but now will apparently have to go find another Occupy community. She had decided to "live on the road" this winter with her car, but local homeless people and other local Occupiers don't have that option. The "25%" -- to estimate the very poor who have few resources -- have had a tough time losing jobs and/or homes, but the worst of it all is the U.S. culture's tendency to be separate individually and thus leave one vulnerable in many ways. Fortunately, there is togetherness in Occupy camps and meetings, even among those who don't feel disposed to tolerate the presence of "difficult" individuals. Once attained society-wide, the power of community can see a whole nation get through extreme crisis, as in Cuba's loss of USSR oil. U.S. Occupiers are not at a loss: a grassroots, do-it-yourself activist tradition is to get the daily components of togetherness functioning: feeding themselves efficiently, providing first aid, mediation/security, media, waste disposal, recycling, etc. Simply the effort at communication and sharing that is being made hourly and in hundreds of locations at this very moment keeps Occupiers together, and will come in handy for future community relationships certain to succeed the current, dying consumer economy. When people occupy consciously a meaningful site cooperatively, this starts turning the key to better things. A vision is worked out, or a beginning made that is improved daily. The same goes for specific programs or demands. Positive ideas fly as discussion continues, while occasional crazy comments are deftly set aside. The way the leaderless consensus process happens, among people thrown together by a common feeling, can only be understood by witnessing it. Self-organizing and communication work to move a group ahead to accomplish great things, if the democratic, anarchistic, tendency is not deflated by apathy or violently trounced. In the latter case, a brutal backlash by the threatened dominant order can generate a more determined reaction by the people. Victory can come, and the tyrant defeated (e.g., Tunisia, Egypt). However, this is no guarantee that the new order will avoid the anti-ecological mistakes of its predecessor. Nevertheless, the bank occupation in Santa Cruz, California gave me a positive vibe when I visited. 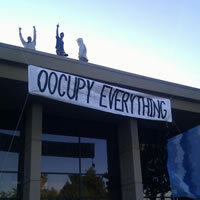 The action was an outgrowth of the more mainstream Occupy Santa Cruz. A former bank building, still owned by Wells Fargo Bank, housed the Comerica Bank. So dozens of protesters took the building over and held it defiantly for several days, ending Sunday. The first time the police tried to eject the protesters, 200 people stood at the door to prevent it. I happened to be in the neighborhood last Friday night, coming at a time when a big meeting was going on inside. As I put my hand on the door nob to enter, all the lights went out -- the police had cut the power. Most people quietly left. In a matter of hours the protesters vacated after repeated police warnings of a raid. In the intervening days, the mayor-elect had been getting much pressure from impatient quarters wanting to see any sympathy and tolerance for all Occupy manifestations end forthwith. All that remains now is an encampment, or tent city, in the riverside park around the corner from the Court House, where Occupy Santa Cruz had a presence, until today, since October. 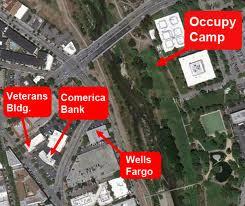 The tent city is being targeted for dismantling at 5 PM Wednesday, Dec. 7, by the police. A restraining order against eviction is in the works. Some of us have promoted for Occupation the northwest edge of town where much open land lies next to a long-existing homeless garden. Maybe the owner would benefit from food gardens, ecological mitigations, and positive press as a "friend to the 99%." Occupying the land will happen, perhaps soon and in many places -- hopefully very peacefully -- but the strategy of the General Assembly tonight (Tuesday, Dec. 6) was to see what happens with eviction attempts at the tent city. The crackdowns on three Santa Cruz groups from the weekend to Tuesday, although not decisive in the class war, reflect an overall weakness in the movement: not enough people to keep the police and their masters in check. So the representative "99%" folks are for the moment swept aside -- expected by the Powers That Be to go suffer their deprivations and outrage in silence. This is no long-term solution for anyone. The recently hardened position of the System shows it has no creative approach, or desire, for bringing about unity of the population. Defense of the status quo and their wealth is the power structure's only thought. One Nation under God? At a time of increasing instability and great need for truly sustainable practices involving the whole community, it would be nice if the authorities and the more comfortable consumers were open to some fundamental changes. Unfortunately, they find Occupy to be a nuisance or threat, despite the honest impulse for achieving more equality and mutual security. When petroleum shortage and climate chaos hit, we'll still all be in the same boat but even more so. Bank of America memo sent out to "field agents": "i) Your safety is our primary concern, so do not engage w/the protesters; ii) While in neighborhoods, please take notice of vacant BAC Field Services managed homes & ensure they are secured; iii) Remind all parties of the bank’s media policy & report any media incidents." 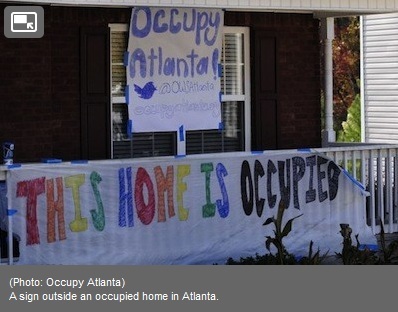 The trend of occupying homes in foreclosure or owned by banks is perhaps the cutting edge of "the movement." Wait, what is the movement, and what are the implications of a singular movement? Although what was called in the 1960s "the Movement" did indeed separate and fragment, today's environmental movement, for example, is too weak to go it alone and not band together with the Occupy movement. So, since Occupy is vibrant and has gotten people's attention more than any movement in recent decades, it's important for everyone in the 99% to get behind Occupy. If there are mistaken notions in the movement, we can work on each one (e.g., that economic growth is good and that the banksters ruined it) -- sometimes seeming to be a thankless task. Yet, the people are finally trying to get together by being together. They're succeeding, and that's a real accomplishment. This aspect of the movement -- being together and working something out, including our common future -- is critical in our dominant culture so lacking in community. An occupation is a level beyond a protest. So even though the Occupiers don't act like a football team going about a play, or a platoon going on a march, or hierarchal-commanded flunkies, they don't need to meet a test of accomplishing something. For they have accomplished it, and succeed as long as they don't quit. Whenever a magic number of protesters has gathered in a designated Occupy spot, in whatever city, that is when the movement got its biggest local boost and helped make history. There is a serious ideological wrinkle in the whole Occupy drama. Although the Occupy movement is watched by everyone who is paying attention to national and global events, it might not be clear that differences are smoldering beneath the surface. A most militant wing of anti-System sentiment, reflecting today a very small minority, can be bolstered when the peaceful majority is shunted aside. The System justifies shunting the majority's representatives -- the Occupiers -- by hoping out loud for more economic growth, even though trickle-down doesn't work, and no more growth is possible via the now depleted resources of cheap energy. Thwarting the peace-loving majority can go on a long time, but not forever. The end is near: the oil-powered, growth economy is playing out, whether or not the banksters had fleeced us and even if they now gave it back (see Erasing/Seizing Wealth of "The 1%" Cannot Create Viable Middle Class or Solve Sustainability Crisis). So it would be wise if society faced it openly instead of fought for the pie and the crumbs. Unfortunately, violent "solutions" can come into play by a few impatient, infantile, testosterone-heavy protesters itching for a fight -- even though almost all of them feel sincere about helping our precious Earth and her plight. When such protesters get their way in the streets for a skirmish or two, it often serves to alienate great numbers of potential peaceful protesters, and gives the militarized police the excuse to crack down violently against "terrorism." Sometimes agents de provocateur appear at protests in order to force the issue and sully the name of a peaceful, rational movement. But the real provokers are those who try to mislead or conceal from the public the fact that shortages of resources are already here, and that preparation is being avoided for short-term advantage and keeping the populace calm. The proof of the pudding: Until each person begins to change his or her behavior, and in general returns to the proverbial Garden, the Occupy movement is just a grouping of fervent, wronged, concerned citizens. Fortunately, the Occupy opportunity includes learning "new" things from one another. The libraries are good for the necessary cultural change too, if they can be kept (out in the) open. "Occupying the land" is key. Growing and gathering food collectively and not for profit may be the biggest key to the culture change that more and more of us see necessary and overdue for the modern branch of homo sapiens sapiens. I visited the erstwhile park on Tuesday, after a mid-afternoon dip in the ocean, and took these after-bulldozing photographs. On reflection on what happened there, I believe something powerful occurred: the neighborhood activists who created it were doing something for themselves that would last. Sure, they knew they were risking rebuke and destruction of their beautiful work. But they are no doubt resolved to take back the initiative and never give up on creating something lasting for themselves and their community. "Volunteer gardeners want more public gardens and less commercial spaces." Independent of and in solidarity with the growing worldwide Occupation Movement, neighbors have occupied a lot, vacant for decades, and built a DIY public park and a resource for the community. 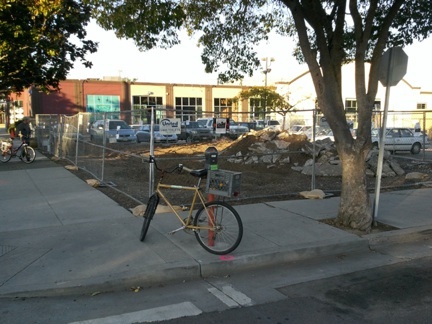 The neglected lot at the corner of Spruce and Pacific has lain vacant and unused for decades. Where formerly it held only trash and occasionally broken furniture, now there are raised flower beds and fruit trees. On Saturday, volunteer gardeners gathered at dawn to build raised concrete flower beds, plant shrubs and fruit trees, and build benches. By early afternoon they hung a sign to welcome people to the new community park. "This is an ongoing process of creation," said one of the gardeners, "We'll be planting through the winter. As these new sprouts take root it will be beautiful!" This is an effort to reclaim the commons, to reverse the trend toward privatization of space and give it back to communities. The new community park is a place to hang out, spend time and meet friends, a place to find one another. For two decades in Santa Cruz , public space has increasingly been fenced off, restricted, and sold to commercial interests. Capitalism strives to restrict the commons, to keep us separate, isolated, and vulnerable. The public is invited to check out the community park at Spruce and Pacific one block from Laurel. Here in Santa Cruz's newest public space, the message is that DIY is all about taking responsibility for the community around you. 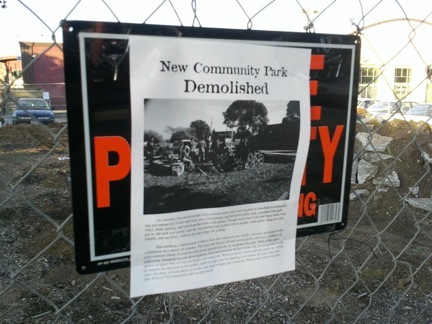 On December 6, 2011, contractors working for Datum Construction Management demolished a community park in Santa Cruz. Before the park had been put in my members of the community, the lot had been dead space and full of rather undesirable things. The community park changed the space entirely, but it appears those in control of the space (for now) would rather it be an ugly lot of dirt. A new community park that popped up over the weekend in an empty lot behind the Saturn restaurant was destroyed this morning. 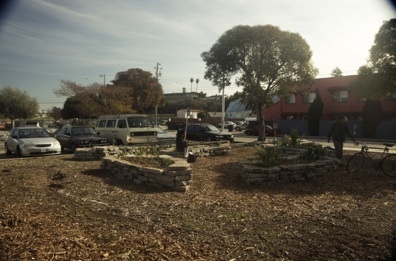 The lot had been a dead space full of trash and other undesirable things for decades until community members cleaned it up and put in beds of plants. The park changed the way the corner felt entirely, but it appears that the incoming Walgreens and the contractors working for them would rather the lot be an ugly lot of dirt. At around 8am this morning, Datum Construction Site Manager Jason Reisinger and his employees began fencing in the community park, even though there were a few people sitting in the park enjoying it. Reisinger came and told people they had to leave the park. He said that if people didn't leave, he would call the cops. Before he finished his sentence, four cars of police he that he obviously had already called arrived on Spruce Street. The folks in the park seemed to be confused and upset, but complied with the police demands that they leave the park. The police left and the fence went up the rest of the way. As Reisinger put up the fence, people asked him if he knew what the plans were, and if he planned on bulldozing the garden right away. He said his orders were just to put up the fence, that he wasn't sure what the plan was, and that there should be a pamphlet on site soon describing what landscaping would happen in the lot. After about 20 minutes, the sound of a tractor hitting concrete planters drew neighbors and passersby toward the lot. People rushed out to the lot, running around or jumping over the fence to stop the tractor from destroying any more plants. Reisinger, who was driving the tractor, called the police again. Angry verbal exchanges were had, and then one angry person grabbed some handfuls of dirt and mulch from the ground and shoved it down the bulldozers exhaust pipe. Outraged, Reisinger shouted "you're destroying private property!" "You're destroying our park!" people yelled back at him. More and more police showed up, as did more and more upset neighbors and friends. Reisinger called United Rentals, bumbling an apology that he hadn't returned the tractor yet because there were too many people in the park yesterday to use it, and now he needed someone to come check it out to make sure it wasn't going to break if he turned it back on. The tractor was out of commission for about an hour before a maintenance person from United Rentals showed up to see if the tractor was damaged. The repairman cleared it for use. Reisinger got back in the bulldozer and turned it back on, blowing soil and mulch up in the air. He then spent most of the next hour destroying the garden under the protection of about a dozen cops. The garden is gone for now, reduced once more to a pile of rubble. While those of us who spent hours working on beautifying the park are angry, we are still hopeful that we can come together to build an even more vibrant and beautiful community park in its place. Garden Destroyed! Time to Organize! Datum Construction bulldozed the community park on the corner of Spruce and Pacific this morning. The garden is gone for now, but we still have hope that we can create an even better, more vibrant park in its place. They have plans, as of today, to install corporate landscaping in the lot, but that isn’t good enough. Their plans simply have a few small ornamental bushes next to the parking spots, while the rest of the 40x60 lot remains barren. If you’re upset like we are, that they’ve bulldozed the park; here is a list of people and companies that should hear from you. Each one is a potential ally in this, and if they here from enough of us, often enough, they’ll realize that the community can and should be entrusted to re-establish the park. Feel free to call back several times throughout the course of the day and week. Remember, even those who seem adversarial may be a potential allies in the future, once community pressure helps them understand that we prefer usable community spaces rather than vacant lots. Make sure to read the notes about each number before you call. Datum Construction Management, Inc. is doing the construction on the new Walgreens going in on the property. This morning Datum destroyed the community park on the corner of Spruce and Pacific. After voicing your concerns with the corporate headquarters, call back and ask for the program manager for Santa Cruz. That person is giving the orders to destroy the park. He is an angry, belligerent person, so be ready for that. The property owner of the lot is HAWKINS COMPANIES COMMERCIAL DEVELOPERS. They are apparently the ones who do not want there to be a park. They are giving the orders to Datum to remove the park. Let them know that if they want to be a part of the Santa Cruz community, they're going to need to show some respect. The corporation they made up for the Santa Cruz project is called HCO, LLC - Santa Cruz, which may or may not be relevant when you talk to them. WALGREENS is what Datum Construction is building in the empty building on the lot (It's going in where Kinko's used to be). This corporation is why there is construction going on at all. Call them and ask them why they are moving in to our community and destroying our parks. If they want to be a part of our community, they need to respect it. 847-914-2500 - Corporate Phone Number (takes some navigating through the system to get a real person to talk to. "...you may be convinced we have already sealed our fate and that humans may well go extinct possibly in a matter of decades, tracking the worst potential climate chaos. So why bother to hang around and breathe out your carbon dioxide? " 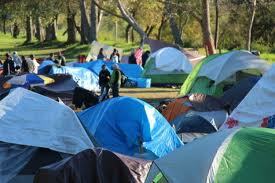 "An error of the Occupy movement might come back to haunt us all after possible short-term victories. Identifying and vilifying the extremely wealthy class is not a solution in itself." "Greetings from the U.S. capital, variously occupied." militants have been staying passive in unification with occupy... think.. have you been keeping up with the violent and unethical practices of the police and their allies??? how long must we endure abuse before you say its o.k. to defend ourselves and the cavilian population that are trying to stay passive?? ?